Professor George holds Princeton’s celebrated McCormick Chair in Jurisprudence and is the founding director of the James Madison Program in American Ideals and Institutions. 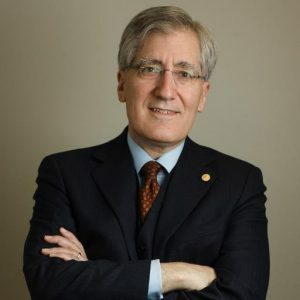 He served as chairman of the United States Commission on International Religious Freedom (USCIRF), and before that on the President’s Council on Bioethics and as a presidential appointee to the United States Commission on Civil Rights. He also served as the U.S. member of UNESCO’s World Commission on the Ethics of Scientific Knowledge and Technology (COMEST). He is a former Judicial Fellow at the Supreme Court of the United States, where he received the Justice Tom C. Clark Award. He is the author of In Defense of Natural Law; Making Men Moral: Civil Liberties and Public Morality; The Clash of Orthodoxies: Law, Religion and Morality in Crisis; Conscience and Its Enemies: Confronting the Dogmas of Liberal Secularism; and co-author of Embryo: A Defense of Human Life; Body-Self Dualism in Contemporary Ethics and Politics; What is Marriage? Man and Woman: A Defense; and Conjugal Union: What Marriage Is and Why It Matters. His scholarly articles and reviews have appeared in such journals as the Harvard Law Review, the Yale Law Journal, the Columbia Law Review, the American Journal of Jurisprudence, and the Review of Politics. Professor George is a recipient of many honors and awards, including the Presidential Citizens Medal, the Honorific Medal for the Defense of Human Rights of the Republic of Poland, the Canterbury Medal of the Becket Fund for Religious Liberty, the Sidney Hook Memorial Award of the National Association of Scholars, the Philip Merrill Award of the American Council of Trustees and Alumni, the Bradley Prize for Intellectual and Civic Achievement, and Princeton University’s President’s Award for Distinguished Teaching. He has given honorific lectures at Harvard, Yale, University of St. Andrews, and Cornell University. He is a member of the Council on Foreign Relations, and holds honorary doctorates of law, ethics, science, letters, divinity, humanities, law and moral values, civil law, humane letters, and juridical science. A graduate of Swarthmore College, he holds J.D. and M.T.S. degrees from Harvard University and the degree of D.Phil. from Oxford University. In November of 2016 he will receive the degrees of B.C.L. and D.C.L. from Oxford.